Yuri Milner is partnering with NASA to develop a mission to Saturn's icy moon, Enceladus. 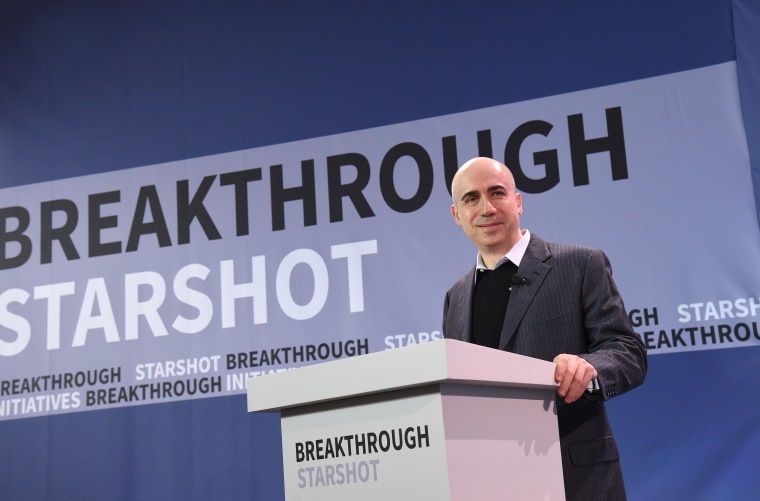 At a space summit in Seattle last year, the wealthy Russian-Israeli entrepreneur Yuri Milner wowed the audience with a radical plan to search for life beyond Earth. Rather than focusing on Mars, he proposed focusing on Enceladus (en-SELL-uh-duss), a small icy moon of Saturn. And rather than waiting to see if NASA might go there, he said he wanted to tackle the challenge himself through his nonprofit Breakthrough Starshot Foundation. “We formed a little workshop around this idea: Can we design a low-cost, privately funded mission to Enceladus, which can be launched relatively soon?” Milner said. It would be the first private mission ever to deep space. David Schurr, the NASA manager who handled the agency’s side of the agreement, says the agency will provide access to its brain trust, “providing expert reviewers and feedback on their design.” The details of that design are still up in the air, but the foundation has already established basic principles. The probe will have to be small, so it can launch at high speed on an affordable rocket, and it will be specialized, so it can focus on its single target and its single goal. By embarking on a mission that is cheaper and riskier than anything NASA would attempt on its own, the Breakthrough venture promises to rewrite the rules of space exploration. While European and American spacecraft are still turning over rocks on Mars, Milner hopes his Enceladus probe will be finding proof that Earth isn’t the solar system’s only living world. At first glance, Enceladus seems an odd place to look for alien life. The airless little moon is just 313 miles wide and fully encased in ice. What’s special about Enceladus is what lies beneath: a warm global ocean up to 30 miles deep. Volcanic activity at the bottom of that ocean could host ecosystems akin to the hydrothermal vents that support colonies of worms and crabs on Earth’s seafloor. Pressure from Enceladus’s ice shell from the ocean also drives huge, geyser-like plumes that shoot out from fissures near the moon’s south pole. From 2005 to 2015, NASA’s Cassini probe repeatedly flew through the plumes and detected carbon-rich molecules — but the now-defunct spacecraft wasn’t designed to look for life itself. Planetary scientist Carolyn Porco, a key Cassini scientist and outspoken advocate for a return to Enceladus, shouted “Yeah!” from the audience when she heard Milner announce his interest in going to the little moon. If there is life on Enceladus, some of it could get sucked up by rising ocean water and shot out in the plumes, where the water quickly freezes into flecks of ice. If that's the case, Porco proposes in a paper published last year in the journal Astrobiology, it may literally be snowing microbes on Enceladus. A spacecraft could fly through this otherworldly storm, sweep up material with a metal plate or an energy-absorbing gel and analyze the snowflakes for signs of life. Breakthrough is currently wrestling with the challenge of reconciling that kind of rigor with the fast-and-cheap philosophy. The foundation’s initial studies showed that a conventional approach would cost hundreds of millions of dollars — more than even Milner could stomach. In an advisory meeting with Breakthrough, planetary scientist Chris McKay of NASA’s Ames Research Center advocated for a pared-down mission that he calls an Enceladus Fast Flyby. He estimated that a probe could go from approval to arrival in less than a decade, at a cost of perhaps $60 million (excluding launch and operation costs). In contrast, the kind of mission NASA has considered could easily take twice as long and cost 15 times as much, assuming it even gets approved. One major cost savings is that the Fast Flyby wouldn’t include any mechanism for slowing down when it reaches Enceladus. “The probe would pass through the plume at high speed,” McKay said in an email. Then it would keep racing along at about 50,000 miles an hour. But one shot at Enceladus could be all Breakthrough needs to sweep up plume material and analyze it for biomarkers — molecules distinctively associated with biological chemistry. Breakthrough seems intrigued by McKay’s concept, and possibly not just for Enceladus. “They’ve also expressed high interest in a search for life in the clouds of Venus and in a search for biomarkers around Europa,” McKay said, raising the prospect of a fleet of privately funded, life-seeking experiments roaming the solar system. Want more stories about the search for life?